Our Roofing Experts Have Years Of Experience With Commercial Roof Repair! Is your building’s commercial roof in need of repairs? Susceptible to issues from a list of various factors, commercial roof systems can develop severe issues in a short amount of time! These problems can include sagging areas that allow water to pool, and even mold or mildew growth, but many issues can be stopped with consistent maintenance. At ECO Commercial Roofing, we work hard to provide high-quality commercial roof repair in Texas, Louisiana, and Mississippi that is both reliable and affordable. Call (833) 200-0571 today and ask to speak with any of our experienced roof repairmen for additional information about our repair solutions, and a repair quote! After an assessment of the damages, our roofers can help you decide the ideal course of action for your roof, whether it might be repairing, restoring, or even replacing! Commercial roof systems, while generally found in a flat or low-sloped style, can alternatively be designed similarly to residential roofs in some instances. The kind of commercial roof system you have will determine which damages your roofing is most vulnerable to. Flat roof materials such as EPDM and TPO, for instance, are susceptible to problems from debris and pooling water. Debris buildup can come from leaves and even trash collecting on the roof, which leads to mildew growth, while pooling water can let the roof age at a rapid rate, and even start leaking! You can see additional sensitivity to UV rays and weather damages in other commercial roof styles. Our contractors here at ECO Commercial Roofing provide reliable commercial roofing repair services for almost every roofing system, and we can also help with replacements! 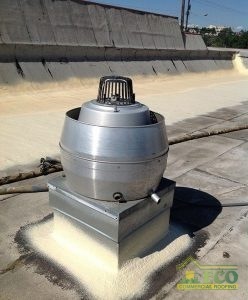 While there are a variety of different methods that contractors utilize for commercial roof repair, one of the most common and comprehensive is the roof coating technique. Roof coatings are excellent choices for commercial roof repairs, as they are cost effective and very effective. An efficient way to protect your roof from developing problems at all is to schedule frequent inspections and maintenance checks. When you’re searching for professional and experienced commercial roof repair in Texas, Louisiana, and Mississippi, contact us today at (833) 200-0571. We are committed to providing top quality repairs to our clients, along with excellent customer service!